Mythical dragons are one of the most popular origami models. There are many different types of dragons, ranging from simple models that are appropriate for beginners to complex dragons that require hundreds of different steps. The Internet is full of instructions for how to make a paper dragon; you can find tutorials for winged dragons, dragons in flight, sitting dragons, and roaring dragons. Dragons can be folded out of origami paper, as well as dollar bills. The key is to read the instructions carefully and take your time as you make the folds. 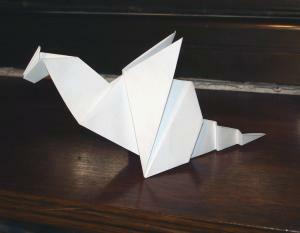 Recently, LoveToKnow Origami spoke to Constantine Tenma about origami dragons. You can also learn more about Tenma's paper dragons on Twitter and Facebook. 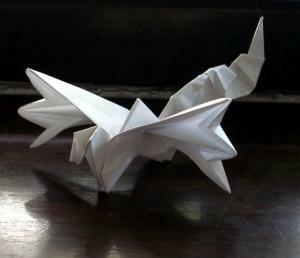 LTK: How did you first become interested in learning how to make origami dragons? CT: I stumbled upon the Eastern Dragon (Ryujin) by Satoshi Kamiya, and I was simply mesmerized by his awesomeness. So, I decided to start folding simple origami dragons, hoping that one day I'd be able to fold the Eastern Dragon. LTK: What is your favorite type of origami dragon to create? CT: I definitely like simple ones, since everybody can fold and appreciate them. From the more complex ones, I like the ones designed by Satoshi Kamiya, and Joseph Wu's dragon, the one with the wings. I'm currently folding the Ancient Dragon by Satoshi Kamiya, and it is definitely my favorite at the moment. LTK: How long does it take you to learn how to create a new dragon model? CT: It depends on the complexity of the model. Simple models I can learn by heart by folding them twice; more complex ones require more attention and repetition. LTK: What folds are most important for a beginner to know when learning how to make an origami dragon? CT: First, the bases like the bird base and the fish base, reverse folds, rabbit ear folds. Squashing is pretty common too. Petal fold is very important to know as well. Actually, all basic folds are important. Sinking can be hard for newbies, but it still is important. Pleating and crimping help with the details such as wings, jaws, wings and so on. LTK: What do you like to do with the dragons you make? Do you use them as decorations for your home or give them as gifts? CT: Both. Even a simple model makes a great gift. LTK: Do you have any tips you could share with LoveToKnow's readers regarding how to interpret the symbols used in online origami diagrams? CT: Just type in Google "origami dragon symbols" and you will get all the information you need. Origami diagrams are often followed with text instructions which name the exact folds you need to do. This helps enormously since you can Google the folds and watch how exactly to do them on YouTube in multiple versions. Also, I think that the most important tip I can give to any beginning origami artist is to fold a lot. Start from simple models that you like and fold a lot of them. When you come to fold more complex origami dragons, you will do much better since all the complex steps you've probably seen in some other simpler model that you already know. You are much better off if you do origami, not read about origami. Just grab a piece of paper and fold something simple and beautiful.